A new bar just opened the other day and no, it's not just any bar. It's the country's first ever eSports bar! Known as "Imperium eSports bar and Video Game Lounge" or just Imperium, it is what it says it is. 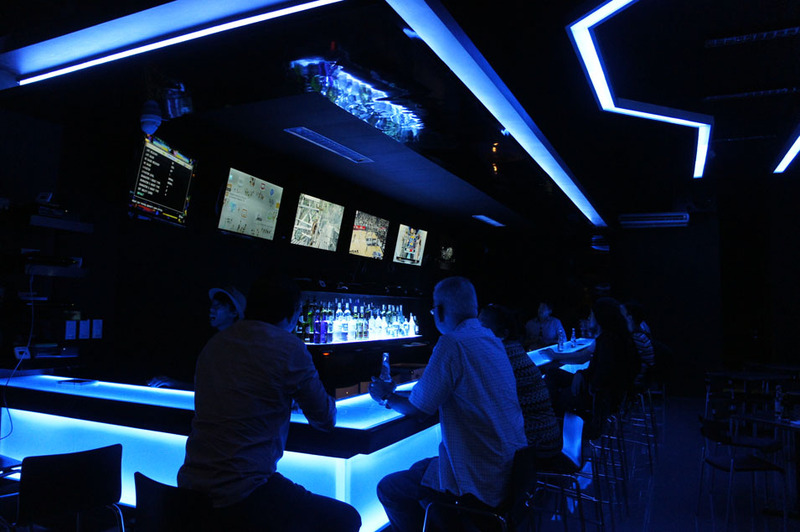 A bar that's also a video game lounge. Aside from a selection of drinks, snacks, and a few alcoholic beverages, you can partake in a few video games as well. From PC games, to consoles, and even the newest next gen consoles, it's the perfect place to spark a few competetive matches while having a few rounds of beer all in one convenient location. Their menus are stuffed in Xbox 360 games cases like game manuals and they even have a few items on the menu named after a few video game references. I remember one in particular called "The Captain Price" which had the description "Whiskey. Lots of whiskey.". From what I saw, they have a total of 12 gaming PCs setup, a projector in the center showing what I think was a DotA2 livestream, 4 consoles (I think it was 2 or 3 PS3s and maybe 1 Xbox 360) setup near the entrance by the couch area, and 5 more consoles hooked up to TVs above the bar counter that I think were running 3 PS3s, 1 PS4, and 1 Wii U. The inside of the bar has a Tron blue light thing going on and were blaring from club/dubstep/bloc party/dance music through their sound system. I met up with a few friends to check the place out and played a few rounds of Injustice with them. Will definitely go back soon, especially once they get their Xbox One's running Killer Instinct. Ccccombo breaker! You can find Imperium at Unit 6B 2nd Floor Metrowalk Commercial Complex Meralco Avenue, 1600 Pasig or contact them at 571-9534 or 09062487476. They are open from 5:00pm to 2:00am. Also check out their new Facebook page and follow them on Twitter. Taken from the Imperium Facebook page. Imperium e-Sports Bar and Video Game Lounge charges a 100 peso consumable entrance fee for people entering the bar. This fee is 100% consumale, and thus will be deducted from your bill the moment you bill out. As soon as you pay the entrance fee, you will be stamped signifying your payment. After you are stamped, you'll be allowed to leave and enter the bar within the same day without having to pay the fee again. Our rates for the PCs are 60 pesos per hour. For Open Time rentals, you will be charged an additional hour for every 15 minutes you consume after the previous. For example, if you use a PC for 1 hour and 10 minutes, you'll be charged 60 pesos, but if you use a PC for 1 hour and 15 minutes, you'll be charged 120 pesos, and if you use a PC for 2 hours and 15 minutes, you will be charged 180 pesos. For the Xbox 360 and PS3, it's 100 pesos per hour. For the Xbox One and PS4, it;s 120 pesos per hour. Aside from these games, we will continue to install new games every few days to update our selection.